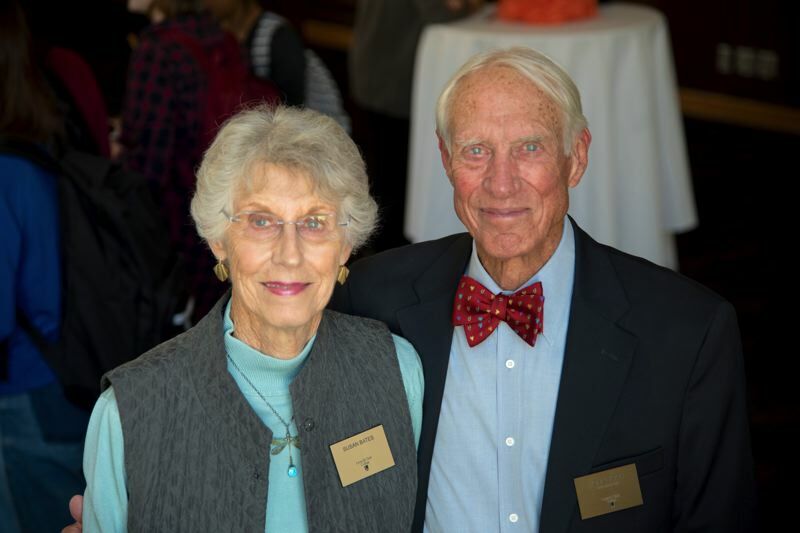 For more than four decades, John and Susan Bates have made an indelible impact on thousands of students at Lewis & Clark College through donation and dedication. 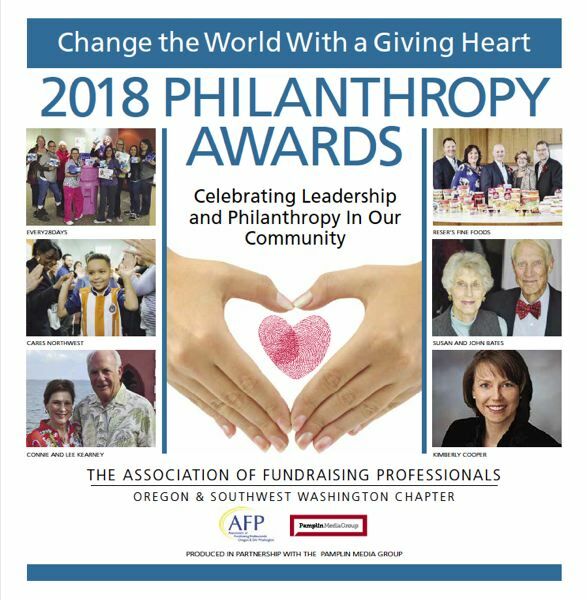 Their continued philanthropy has improved the student experience through coursework, programming, and networking events to help students learn to build a better future. Additionally, the Bates' support of staff and structure helps build a foundation for further growth. In 1975, John joined the faculty at Lewis & Clark College as an associate professor of finance where the following year he was named "Outstanding Teacher in the College of Arts and Sciences." After leaving the faculty in the 1980s, John returned to serve as a member of the board of trustees from 2003-2010; serving as chair from 2004-2007. Named a Life Trustee in 2010, John is a member of the Law Board of Visitors and serves the advisory board executive committee of the John E. and Susan S. Bates Center for Entrepreneurship and Leadership of which he and Susan pledged a $1 million endowment. "Both sets of our parents believed in gifts to their communities, such as the Oregon Historical Society and the University of California. We witnessed the pleasure that sharing gave them," said Susan. "Our gifts have followed their path and we are pleased to see our efforts help support activities that we feel are worthwhile." The Bates' benevolence has created a ripple effect in the Lewis & Clark College community setting a tone for a new era at the school with John and Susan as the vanguard. At a board of trustees meeting in September 2017, the Bateses pledged a $1 million commitment to the school, just weeks into the new tenure of President Wim Wiewel. Their pledge inspired others; two other trustees immediately followed the Bates' lead with their own $1 million donations. In February 2018, two more trustees committed a total of $3 million more. In less than a year, another $275,000 was added to the Bates Center by trustees and alumni. John and Susan's inspiring initial gift encouraged others to follow suit. "With this gift, we want to enhance the center's great work and make it soar," Susan said. "We will continue to support education. We have seen and believe in the opportunities brought about by caring faculty and top-flight academic institutions." The Bates' support is not solely limited to the Bates Center. All three schools at the college have benefited from the couple's generosity in the form of student scholarships, facility improvements, legal clinics, athletics, faculty research, faculty support, and unrestricted operational support. Having held key positions on Wall Street, John founded Bates Private Capital, which employed more than 200. He has been awarded the Donald G. Balmer Citation for outstanding voluntary service to the college and an Honorary Doctorate of Humane Letters. Together, John and Susan received Distinguished Honorary Graduate Awards from the law school. "We are grateful for the educations that we received at Oregon State University, where we met on a blind date, and the University of Oregon. When John became a professor at Lewis and Clark 43 years ago, it felt like a new home," Susan said. "We watched our students mature, grow, and become successful and good citizens. That was our reward."